It might be considered cheating, writing about this on a blog that celebrates spontaneous, improvised music. But when you've got talent Quincy Jones' magnitude with a host of jazz greats like Clark Terry, Paul Gonsalves, Lalo Schifrin and even Roland Kirk (yes, that Roland Kirk), then you just can't keep it down. This track is rightly famous, having been used in various places including the 1998 world cup and the movie 'Austin Powers: International man of mystery', as well as having been sampled heavily. notably by Dream Warriors on their 1991 release, 'My Definition Of A Boombastic Jazz Style'. The fact that this track is so well loved is a real case of the cream rising to the top, as it's a great piece of music. Jones' tight orchestration and the irresistibe latin rhythms pull it along in the best big-band style, while it carries enough melodic hooks to drill itself into your head. In fact I've only written about it tonight as my wife has been walking about the house singing it all week, such is it's melodic insistence. I'll say no more, it's such a well known tune that you'll all be singing it already - but if you're not then head slightly to the right and up a bit to listen to it on the radio player. Watch out for the flute solo in the second half - ohhh yesss. 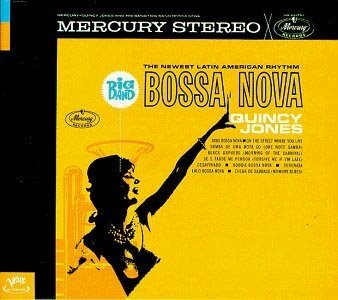 At this time Quincey Jones was, among other things, head of Artist and Repetoire at Mercury Records, and this album was a chance to let his hair down a bit and feature some of the individual voices on the label at that time - particularly Rahsaan Roland Kirk. Many of the tracks on this, and Quincy's 'Mancini' album of the same year featured 'novelty' solos from Rhasaan (not that Kirk was a novelty musician in any way). Have you noticed that whenever you hear this track (Soul Bossa-Nova) on an ad or whatever it always cuts off or loops before Kirk's flute solo - grrrrr! Like the man himself, the solo is short, sweet, and perfectly formed. Well that's what I think anyway - you may feel different. Woof!! Its use by the Dream Warriors and Mike Myers in Austin Powers comes from watching Canadian TV in the '70s and early '80s, as the cut was used as the theme song for a Canadian game show called Definition.